Anatomical Position Subject is in upright position, facing front w/palms turned to the front. Median Line A line drawn perpendicular through the ctr. of the forehead,nose,chin,chest,abdomen,pelvis,and between the legs, dividing the body into a right & left half. Plane A real or imaginary flat surface going through the body. 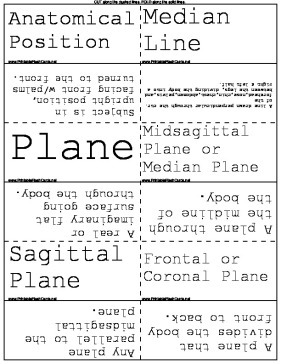 Midsagittal Plane or Median Plane A plane through the midline of the body. Sagittal Plane Any plane parallel to the midsagittal plane. Frontal or Coronal Plane A plane that divides the body front to back. Transverse or Horizontal Plane A plane that cuts across the body at a right angle to the long axis. Section A piece cut from the body similar to a slice of bread. Medial The part nearest to the midline of the body. Lateral The part farthest from the midline of the body. Palmar Palm of the hand. Plantar Sole of the foot. Volar Either the palm (hand) or sole (foot). Inferior Away from the head. Cephalic Head end of the body. Caudal Tail end of the body. Proximal The part closest to its source or origin. Distal The part farthest from the source or origin. Supine Lying on back with face up. Transverse Crossways to the length of a structure. Vertical Perpendicular to the horizon. Horizontal Parallel to the horizon. Peripheral On or near the surface. Superficial On or near the surface. Internal Inside of the body. External Outside of the body.